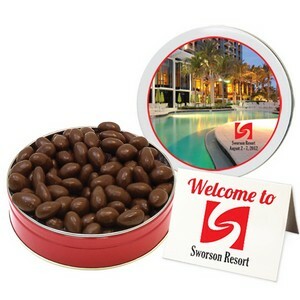 Mini tin of chocolate covered almonds (12 Oz.). Mini tins pack lots of gourmet flavor in a small budget! Perfect for room drop gifts for events, meetings, out of town guests and more! Packed in Sleeves/ Tins Heat Sealed. Add your full color design or company logo. Fulfillment programs are available including company store and timely release programs.